Whether you're suffering from pain associated with an injury, or chronic pain associated with conditions like arthritis or fibromyalgia, you know how frustrating and often debilitating it can be. The most common "solution" for pain management among conventional doctors is prescription medications. But simply masking the symptom - the symptom being your pain - does nothing to solve the problem at its source. Certainly conventional medications can be effective, but you are best served when they are integrated with an alternative therapy like acupuncture Phoenix. After all, the more balanced the energy in your body, the better all of its systems will perform, including those from which your pain is emanating. Our acupuncture Phoenix clinic can help you get your pain under control naturally and help you weave your way through the myriad of conventional and alternative medicine treatments. 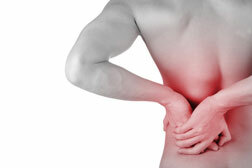 Click here for holistic pain management options. "We first met Dr. Cline in 2008 when our then 9 year-old son became ill for which his pediatrician/specialists were wanting to treat by putting him on various medications we felt would be more harmful than good. Dr. Christy Cline, through an aggressive ellimination diet discovered various food allergies. By discovering these allergies and the acupuncture treatments he received, and continues to receive, our son became and remains stronger and healthier. My husband developed severe back problems that included spinal stenosis, degenerative disc disease, arthritis, etc., that caused extreme pain and at one point he lost all feeling in one of his legs from the knee down. Our son said he should see Dr. Christy Cline that he was certain she could help him. Seeing as we had a trip planned for Europe he was willing to try anything. After three treatments he regained the feeling in his leg. It should be mentioned that he also received three epidurals as recommended by his primary care physician during which time he did not receive acupuncture. They did not seem to provide any relief and after the third one he was actually in more pain. He went back to Dr. C prior to our trip to Europe and was able to go on our trip and actually walk great distances with little to no pain. He did have to have back surgery but would have not been able to enjoy our trip to Europe or even been able to tolerate the pain or walk had it not been for Dr. Christy Cline. She is very caring and compansionate and we really appreciate the fact that she takes time to listen to your concerns. We HIGHLY recommend Southwest Integrative Medicine."